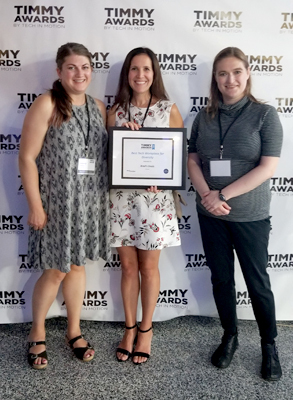 Tech in Motion publicly recognized Brad’s Deals commitment to diversity, naming the company First Runner-Up in the Best Tech Workplace for Diversity category at the 2017 Timmy Awards, held at 1871 on September 21, 2017. Event co-organizer Maeve Cloherty told the assembled crowd that more than 390 Chicago tech companies applied for four awards that included Best Tech Startup, Best Tech Work Culture, Best Tech Workplace for Diversity, and Best Tech Manager. Each category was narrowed to ten finalists before opening to public voting, which accounted for half of each company’s vote total. Brad’s Deals application focused on its gender diversity, noting that the company is more than 56% women, 69% of management, 66% of senior leadership, and 50% of the executive leadership team. The company also launched its Women’s Tech Accelerator in 2016 and recently kicked off its second cohort, thereby extending its commitment to encouraging women in tech into the greater Chicago community. If you’re interested in working at one of Chicago’s best tech companies for diversity, you can check out open positions at Careers at Brad’s Deals.